In light of the tragedy at the Boston Marathon last week, Boston Magazine has found a unique, and sensitive, way to tell the story of the victims- through their shoes. 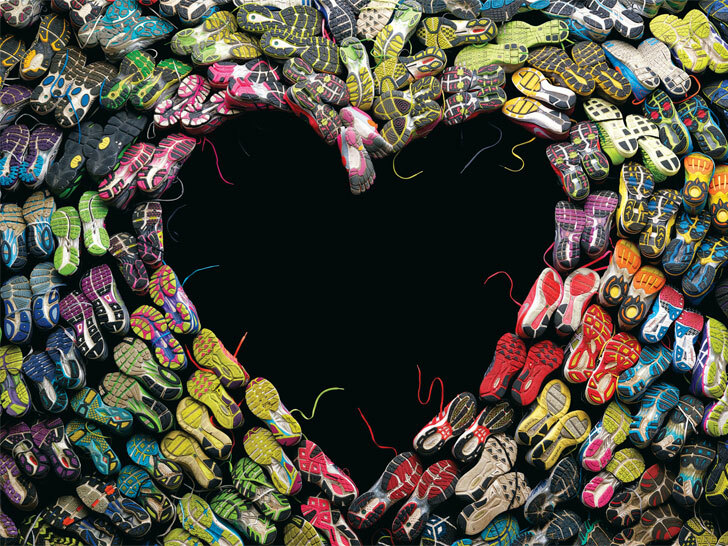 May’s issue, which hit newsstands with an overwhelming reception, features a front and back cover memorial- featuring the runners’ sneakers shaped into a heart. The symbolic photograph is accompanied by first-hand stories by the participating runners- very production brought together both Boston Magazine staffers, their families, and runners involved in the marathon, during a very scary, traumatic time. When the horrific bombings happened just a few days before May’s issue was going to print, editor John Wolfson knew that the issue would have to revamped- to report the news as well as reflect the stories of the victims- in just three days. 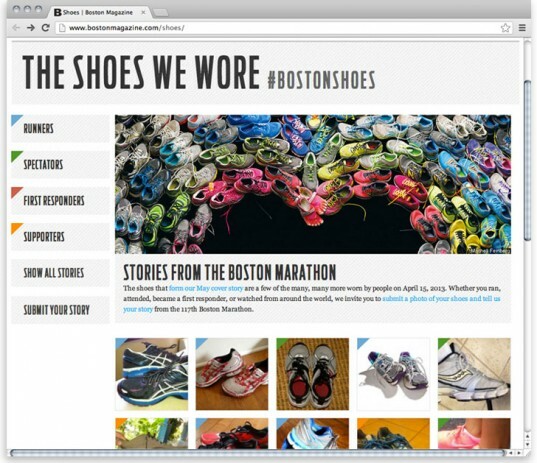 After the idea to photograph the runners’ shoes was hatched, the process of getting shoes and willing participants to tell their tale happened organically- over social media. Facebook postings and tweets were shared by staff and readers, with more and more interested runners sending in their stories and vowing to bring in their shoes the next day for the photo shoot. Rather than a few writers and editors focusing on the stories, the entire staff pulled together, working as one to pay homage to the survivors and victims of this tragedy, and to make a beautiful image to honor them. The final shoe count was at 120 pairs, and New York photographer Mitchell Feinberg was chosen to immortalize the vision. Each pair of sneakers was also shot separately, and is accompanied by its owner’s story. The May issue of Boston Magazine goes beyond just the printed magazine. Starting tomorrow, Boston Magazine’s website will include a special extended section sharing all of the victims’ stories, and include a place where people around the world can upload their own stories, and a photo of their own shoes.